Philadelphia, PA Violin Lessons Near Me | Fun Classes. Top Tutors. Check out some of our most popular teachers near Philadelphia, PA including Princeton, Wilmington, Trenton, West Chester and Newark. Philadelphia, the City of Brotherly Love, is rich in music history and is home to the Pennsylvania ballet, Opera Company of Philadelphia, and the Philadelphia Orchestra. With such a great cultural resources and a wealth of talented musicians, it's an ideal place for anyone who wants to learn how to play an instrument like the violin. Sometimes, students who wish to play the violin attempt to learn on their own, however, that can be challenging, as the techniques required to be successful on this instrument are very specific. Philadelphia violin lessons will help you to become the best player possible and will give you the skills to play not only classical violin, but to explore other genres including pop, country and even rock. There are many benefits to taking Philadelphia violin lessons with a Certified TakeLessons Instructor, including a risk-free 100 percent money back guarantee. TakeLessons violin instructors are chosen from the top 8 percent of interviewed candidates, with many of them teaching in schools and performing in the Philadelphia area. 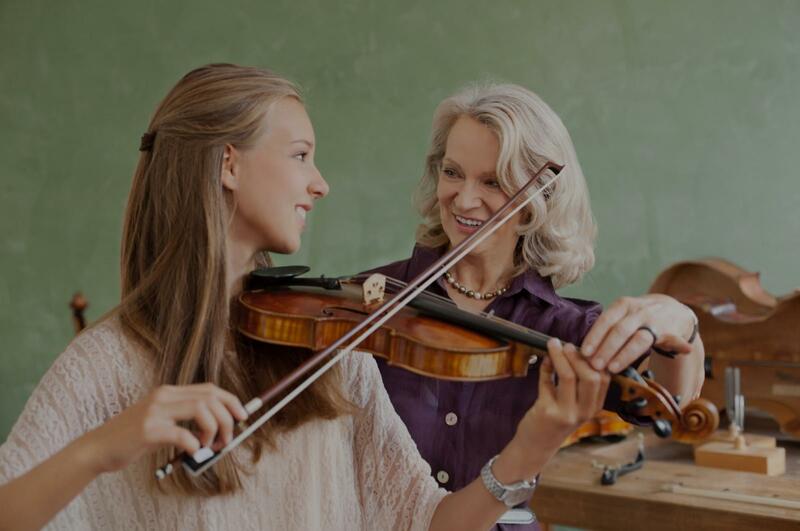 By visiting our violin teacher profile pages, you can review their background, education and experience as well as ratings and reviews from other students, guiding you in finding the perfect violin teacher for you, no matter what your age or skill level! All matters will be discussed prior to lesson/In lesson. Please message me about availability. a teaching position at the Meadowmount School of Music as her teaching assistant where it was a huge success in her teaching career. She has been teaching the violin and piano privately over 10 years. The students have weekly lessons from either 30 minutes, 45 minutes, or 60 minutes depending on their age and ability. Students are given the opportunity to perform in recital. She teach and work hard to help each student achieve their full potential. Through the lessons I help students on understanding the fundamentals of music theory, creating an ideal sound, musical expression and coordination. Every student is different. I work with students individually and use different approaches for each one of them. Such as methods, repertoire and lesson skills. But most important of all, I always make sure that my student does not loose interest and have fun making music! Yale University and String Pedagogy Master degree at Temple University, I love both teaching and playing. I'm one of the faculties at Symphony in C Youth Orchestra and St. Malachy School where I work with many different ages and levels of students. I also teach at Petite Ecole Bilingue Institute working with kids as young as 3 year olds to Kindergarten specializing in early childhood education through music and violin. I've had my private studio for nearly 10 years from young children to adults. I'm also an active orchestral player where I'm a member of the Virginia Symphony, Allentown Symphony, Symphony in C and New Jersey Capital Philharmonic. Through the lessons I help students on understanding the fundamentals of music theory, creating an ideal sound, and musical expression and coordination. Whether they're trying to just have fun with music, improve their basic skills or prepare auditions such as School or District Orchestra, Youth Orchestra (PYO PYAO or many other local groups), I try to find the best for each students. Kevin has been enjoying his lessons. Violin is my primary instrument I can teach violin students from the very beginning to the college level. I will happily work on any style of violin music with you! My name is Emily, and I am looking for students of all ages and abilities! I have been playing violin for 14 years and have a degree in violin performance from Temple University's Boyer College of Music. I have taught violin in various music programs in the Philadelphia area. I can also teach viola and piano from the beginner-intermediate level. I have a very encouraging and positive teaching style, and you will have fun as you learn and explore new things about music! Very nice and professional. My daughter loves her. I’m an adult viola student which is kind of different for me. I started playing again after a couple years and I’m trying to learn ways to play with other musicians. Emily has been really good with helping me focus on what I want to learn. She is patient with me and also plays with me and makes me feel comfortable in my lesson. afterwards I feel good and positive and I want to play more! I suggest her for anyone trying to be creative and wants to improve on tempo, rythm, tone etc. she’s good. It is a year later and my daughter is playing well. Anje enjoys her classes and thinks Emily is a great instructor. Jenny (Jingwei) Li is a Duke University graduate and part-time professional violinist based in the Philadelphia area. She is interested in helping students learn (and find true joy & meaning in) music. Highly insightful, kind, and flexible, Jenny aims to incorporate a multidisciplinary approach into her teaching and hopes to make music lessons as affordable as possible to all students. Jenny (Jingwei) Li is a part-time professional violinist based in the Philadelphia area who is interested in teaching music performance with a multidisciplinary approach and making lessons as affordable as possible. y Davidson. During her senior year, Jenny was nominated by the Duke music department as their representative for a prestigious Louis Sudler Prize. Upon graduating from Duke, Jenny was awarded the Julia Wilkinson Mueller Prize for Excellence in Music, a Benenson Award in the Arts, and graduation with distinction in music. She was also honored to perform a solo for Duke University's board of trustees, including president Richard Brodhead and Apple CEO Tim Cook. Continuing her music studies in the past two years, Jenny has participated in several highly selective music festivals and workshops, including the Luby Violin Symposium, the National Orchestral Institute, and the Emerging Artist Fellowship Program at Garth Newel. Most recently, Jenny has performed in the first violin section with the Temple University Symphony Orchestra, the Central Pennsylvania Symphony, and the Hershey Symphony. In addition, she studied with Dr. Eduard Schmieder, the distinguished Laura H. Carnell Professor of Violin at Temple University's Boyer College of Music. In 2017 and 2018, Jenny performed for several invitation-only corporate events, including the Pennsylvania Bar Association's annual dinner, a private concert for Keith Wargo (managing director of Mizuho Americas), a Tesla Drive event hosted by Offit Kurman, the Arts Against Bullying Gala hosted by FSP Against Bullying, an Awards Banquet hosted by the Dauphin County Democratic Committee (featuring keynote speaker Julian Castro, the Housing & Urban Development Secretary under President Obama), as well as the National Healthcare Symposium hosted by Geisinger Health. The Geisinger symposium was attended by distinguished guests such as Hillary Clinton, Dean Ornish, Gail Wilensky, Judy Faulkner, Thomas Lee, Howard Dean, Governor Wolfe, and Ezekiel Emanuel. Outside of music, Jenny continues to explore her diverse interests in clinical research, global health, social justice, filmmaking, writing, and education. Jenny has designed and taught an official Duke course on HIV/AIDS for several semesters, as well as having served as a writing tutor and teaching assistant for several courses at Duke. Feel free to contact Jenny for more information. Jenny was wonderful, so accommodating and attentive at my individual needs. I can't wait for my next lesson!! Thank you Jenny! An excellent and professional teacher who has passion to help both young and adult learners to enjoy the progress in violin performance. We've been teaching for 7 plus years and our students have gone on to attend conservatories and win competitions. We specialize in classical, pop, and EDM, typically use Faber and Suzuki books, and play many music games with young students, to ensure everyone has fun learning. We love working with students of all ages and experience levels and I can't wait to meet you! Hi, there! My name is Rada, and I've been teaching private lessons since 2011, and have loved helping students start learning a new instrument. I am highly qualified and hold a degree in music performance, education, and have enjoyed teaching for years. Rada is a kind and knowledgeable teacher! I learned a lot from her in a short period of time. She offers excellent professional advice, is flexible with her hours, and very easy to contact. Would definitely recommend her as an instructor! Ms. Rada Culciar is a well educated and very professional instructor. Her teaching approach is organized and easy to follow. I have made wonderful progress under Ms. Culciar's instruction. I would encourage anyone who would like to study the violin (or any other subject of study) to take lessons with Ms. Rada Culciar. Always well prepared and intuitive about my daughter's needs making for really great lessons. Learn to read music easily. I usually work with children or teenagers and I can teach someone who has never played an instrument before as well as intermediate players. I use a variety of books that teach theory, rhythm and playing songs such as the Suzuki method, I Can Read Music, the String Builder series and Winning Rhythms by Edward Ayola. For the pieces I focus on a routine to prepare and perform "performance ready" pieces so students gain confidence in their playing and know the level of expectation for what a professional polished piece sounds like. For complete beginners I focus a lot on the correct positioning because that is the base for playing and it is very hard further down the line to change a bad habit related to positioning. For more advanced players I focus on the core skills such as intonation and the ability to read notes and rhythms but I also incorporate how to add musicality and flare to a piece so that it is emotional and interesting to listen to. I am a computer science student and musician at Bryn Mawr College. I have been playing music for 12 years and teaching for 4. At college, I am principal viola of the Bryn Mawr-Haverford Orchestra and I also am part of a chamber music group. In high school, I was in the Maryland All-State Orchestra for four years and was in the Maryland Classic Youth Orchestra (MCYO), one of the most prestigious orchestras in Maryland, for four years. During my summers, I attended the Interlochen Center for the Arts high school music program. I have been taught by musicians from the National Symphony Orchestra and National Philharmonic. the viola section of that orchestra. I use a comprehensive set of books that teach theory, rhythm and pieces that I use to teach students how to prepare and perform "performance ready" pieces. Jocelyn was very professional and patient with my daughter who is just a beginner. We are excited to see progress from week to week! Jocelyn came to our home and worked with our son. She was very patient and kind with him and was able to find what to correct on the first lesson! She recommended some books for us to buy and I think that she will be a great teach for him. Jocelyn came to our home and made my daughter very comfortable with her first private viola lesson. She was friendly and patient. She quickly spotted technical issues with my daughter's playing and suggested appropriate materials for her to practice. We've only had one lesson so far, but I think this is going to be a good "match!" The Violin Studio of Andrea Levine offers violin lessons for children, teens and adults, from beginners to advanced players. Lessons are conducted one-on-one in my private studio in the Spring Arts District of Philadelphia. I teach traditional, classical violin playing, and students can expect to gain not only a comprehensive understanding of violin technique, but also a thorough grasp of note-reading, musicality, tone production, rhythm, ear-training, theory and practice/learning techniques. Music and the violin have always resonated strongly with me. After winning various competitions in my childhood years and traveling to China to perform as a teen, nothing seemed more natural than making a lifelong commitment to the violin. I moved to the culturally and musically-rich city of Boston, MA, to study violin performance for my undergraduate degree, and then I went on to complete a master’s degree with honors in Pittsburgh PA.
p professional orchestras and performing consistently with pop music artists like Josh Groban. I have had the honor of working in varied professional settings and with inspiring musical colleagues around the world. These experiences have helped to transform me into a well-rounded musician who thrives on stage, in the pit, and behind a camera, who puts just as much passion into teaching Vivaldi to my students as into performing ACDC’s Back in Black to cheering crowds. Along with performing and teaching, I also own an award-winning live musical entertainment company called Miss Musique, which provides live music for weddings, parties and other special events. And in my free time I enjoy doing yoga, checking out Philadelphia’s newest restaurants, and playing with my cat Mittens. The average cost of 60-minute violin lessons in Philadelphia is $75. While the exact cost will vary depending on the teacher, type of lesson, and your location, you should expect to spend anywhere between $46 and $130 per hour. For the best experience, we typically recommend 60-minute violin lessons. However, students looking for a more affordable option may want to consider a shorter lesson length of 45 or 30 minutes. On average, 45-minute violin lessons are 22% less expensive at $59, and 30-minute lessons cost 43% less at $43. Curious how much violin lessons cost in your area? Do a quick search to get local prices for the best violin teachers near Philadelphia. Philadelphia, PA teacher: Elicia R.
and tone. I still have a long way to go but Elicia is very patient and sets short term goals which are practical and each week I can make progress which is very encouraging. Thank you Elicia." kes violin possible again-flexible, affordable and available. Miss Reynolds know how to guide us (example if the violin goes out of tune) and teach my daughter just at her level and keep her challenged just right. Perfect!" "I've only just completed my 3rd lesson, but I've already improved a good deal. laying and giving you advice at how to play better or what to correct. She's also very flexible in how she teaches - whether it's more streamlined or casual lessons, she helps your improve either way." "She is good at relating to my daughter. She takes the time to explain things she doesn't understand. Absolutely recommend!" "Elicia is really nice. It was my son's first lesson with her. She has a lot of patience and explains everything clearly for my child's age." chool orchestra audition, even though we were not on Amanda's roster of clients. In two 30 minute private lessons she was able to acclimate my daughter to the two challenging audition pieces, address questions about technique and also taught her how to tune her instrument. Thanks to Amanda's excellent teaching and flexibility, my daughter had a great experience for her first audition." Philadelphia, PA teacher: Amanda B.
e my entire time trying on my own. Can't wait to get to the next one." "Excellent teacher! Really patient and helpful!" Philadelphia, PA teacher: Emily S.